This immediately pushed my “Good Idea” button. I’ve done several No Spend and Eat From The Larder Challenges, and it clicked that right now was a great time for my family to do a No Spend month. A couple of big expenses have eaten into our savings and it would be fantastic to build that back up more quickly. I have a very, very, very full pantry right now. Breaking “hedonic adaptation” for everyone – but especially the kids – before December and Christmas time, makes for more gratitude and appreciation. I’ve gotten kinda lazy and repetitive when it comes to cooking and I’d like that kick-start to use up things in a creative way. A specific “No Spend” challenge will provide tons of fodder for from-the-larder cooking videos for my Patrons. If you’ve been a reader for a while (and I think nearly everyone who’s still chugging along with me in this space is a regular at this point) you know that I encourage challenging but customized “rules” for challenges like these. 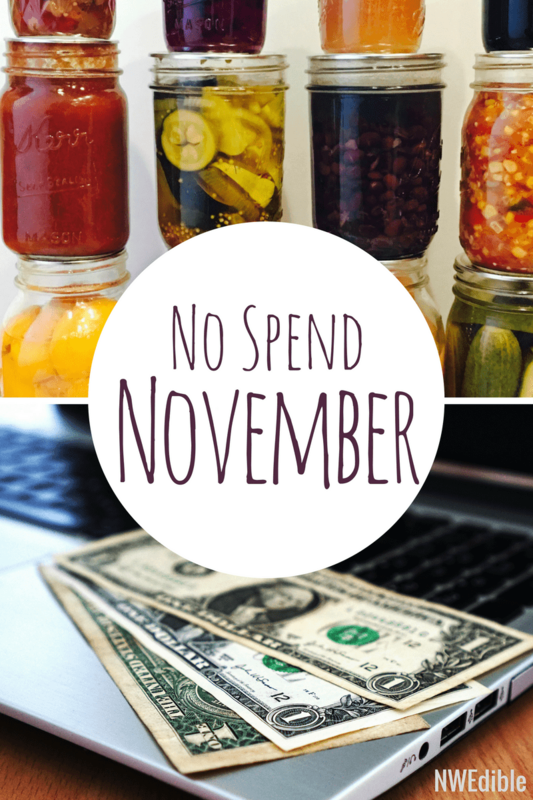 “No Spend November” is, therefore, more of a cute savings mnemonic than a full pledge to spend $0. These are mine! Yours can be different! Regular household bills like electricity, water, car insurance and Netflix will still get paid. Regular planned kids activities like piano lessons, etc. will still be done and paid for. Periodically the kids have opportunities to attend plays, concerts, lessons, etc. for homeschool enrichment. Although we don’t have anything planned, if something like that comes up, we will pay for it. Gas will be purchased such that the gas tank does not full below a 1/2-tank. In the past, we’ve allocated a certain dollar amount to gas, and “gamed” the system by running on fumes until the month’s end when we could fill up. For reasons of preparedness, we don’t let the gas tank drop below a half-tank anymore. Since Homebrew Husband doesn’t commute to work any more, our “essential” driving works out to about 20 miles a week so gas just isn’t that big of an expense anymore. We’re still finalizing Thanksgiving, but I will probably host. Assuming I host, I’m giving myself a $150 budget to purchase items specifically related to making the holiday meal (mostly the meat). Homebrew Husband is currently tutoring a student. Periodically he meets with this student at a coffeeshop. On those occasions, he will buy coffee or such to “pay rent” for the space in the cafe. The following known purchases are exempt from No Spend November: printer paper for school work, cat food and litter as necessary, and a $15 fee for a licensing exam Homebrew Husband needs to take mid-month. My local Yuppie-Hippie Market send out an amazing set of coupons where it’s buy-one, get-one on organic free range chicken and free organic pears and stuff. You can only redeem one coupon per week. I will most likely redeem them all. Hey Erica, that’s a lot of exemptions! Meh, maybe, but probably not really. In past months I’ve just declared a total weekly or monthly budget that I would not go over for “incidental” spending – basically everything but monthly recurring bills. Back in 2011, for example, I gave myself a $250 budget for the month. I think total incidental spending this month will be about $150, plus another $150 for Thanksgiving expenditures. Thanksgiving is my favorite holiday of the whole year, and the only holiday I really go all-out for, typically, so I feel zero guilt about building in some turkey money. All told I expect total monthly expenditures will be around $300, which will be a nice reduction over our typical monthly expenditures even compared to months without a major holiday. I’m looking forward to breaking the hedonic treadmill and putting some extra money back into our savings account. Every Friday this month I’ll do a weekly Frugality Friday wrap-up where I’ll tally up how much we spent and show some of the food I’m making from the larder. Feel free to let everyone know how you’re doing. Anyone who wants to participate can swap tips and status updates. 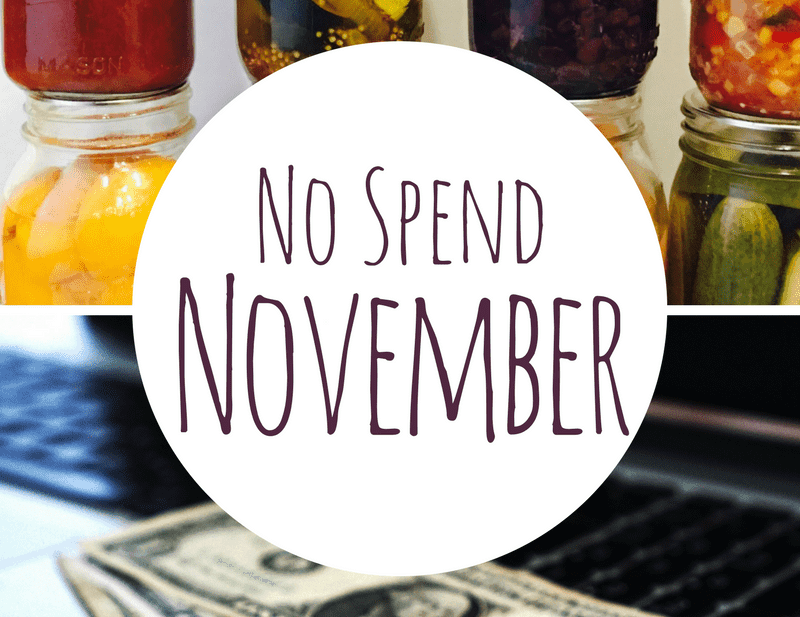 If you want to participate, just leave a comment and let us know: what are your No Spend November rules and goals this month? I would love to join in but I’ve already spent a lot on groceries this month. We hadn’t done much grocery shopping last month so had to do several big trips. Excluding food I am hoping to abstain from miscellaneous spending (clothes, shoes, eating out…). I normally do a no spend in January to recover after all the spending over the fall/holidays. I’m always fascinated (and use as motivation) reading about no spend months. Thank you, Erica, for the reinforcement. We had already decided on no spending this month other than mortgage, regular bills, gasoline, and 3/4 or less of the usual grocery bill. I already bought my part of the Thanksgiving meal. We’ve got to stop hemorraging money! I love this. My pantry is almost full too with things I bought or canned. I dont know how to incorporate most of them into meals. I just had to can and freeze excess garden produce to save it. It will be eye opening for me to see how a chef does it so I can use some up and learn what to do better in the future. Erica, you are the MOST prepared and disciplined person/householder I know! You’re also inspirational. I don’t have the energy or desire to do a no-spend month BUT I am fired up to do an eat-from-the-larder month. And I NEED to do this, so that’s my commitment. Exceptions: my Wisconsin garden is nearly done, so fresh salad greens and fruits. Also I’ll buy canned or dried legumes if/when I use up my supply. So, I’ll use up all the frozen meats and fish, make a big dent in frozen veggies, canned and dried goods. Let’s go! I’ve never felt the need to do a full no-spend month, but I am going to make an effort this winter to really eat down our freezers and pantry. By the spring, I hope to have 75% or more of our meat production supplied from the backyard so we will end up storing more of our food “on the hoof”. We also have quite a few bushels of winter squash and approximately 400 pounds of potatoes (with more still to dig up) to work through. Wait, which local Yuppie-Hippie Market do they have coupons for free organic pears?? PCC…but it might just be for members. The coupons showed up in my mailbox. Whattttt? I am a member and didn’t see these in my mailbox. Accidenalcycle me thinks. Darn it! I’m in. We still need to buy things like milk, fruit for the little guy and diapers obviously but nothing will be purchased that can’t wait a bit. Then a bit longer. Our stocks are full and I need to be more disciplined about using all of the stuff i’ve preserved/frozen instead of hoarding it. There are still some chickens out there that need taken care of too. Sorry in advance for way too much detail, both babies were looning around late into the night and my one tepid coffee is just not winning the battle. -TheHubs does most of his documentation work at a coffee shop walking distance from the house, a coffee rent will be exempt. He has promised to not buy the tempting pastries. We shall see how that goes. I completely understand needing a break from the house, it’s not quiet here.. which makes thinking tasks complicated. -Gas. We just don’t live in a city with a functional public transit service… and nothing is set up for not having a car. It’s frustrating. -I promised TheTeenager a shopping trip, fugly sweaters and winter present day things she wants to get for people. And while she has some set aside just for that, I want to help as I can. If we get that done before the terrible “shopping days” start it’ll be easier. -Get back in the habit of cooking what we’ve got First, and only going to the store when we need to, not as a regularly scheduled event. Consider the store’s curbside pick up services to help cut down on “oh yeah we need” items because we usually just really don’t “need” it’s a “want”. Life trundles on without a new stock pot, regardless of how nice it is to not use the waterbath canner to make stock in..
Re: your introduction to your newsletter… it may be the most important item on it. I’d like to toss in two ideas…’love’ … definition? It is the universal panacea! But can mean charity, lust, liking, infatuation, devotion, etc., etc. Plus, I think we can’t order ourselves to love what seems unlovable (nor ‘believe’ something that seems untrue). In long-time wrangling with this, for me, I love what I enjoy. And I can choose to look for something enjoyable in the ‘unappealing’. That simple choice is often revelatory. I too have put a moratorium on spending. I am going to eat only out of my pantry and freezer (needs a sort anyway), no groceries except milk (have to have it for tea), and greens. I have big bags of carrots, onions and potatoes already. I will top off the gas tank when necessary of course. I have also allowed myself $30 for the occasional coffee out with friends-it’s important that I don’t get stuck in the house all the time. I do have to find more ways of increasing my income and decreasing my expenses! Already started to pull back as work life has calmed down some. Getting back to cooking and being creative where I can instead of buying a solution. Found a way to ‘hack’ my centerpiece for Thanksgiving so it costs $0. It involves borrowing a few items from work since we are taking down decorations the day before thanksgiving (yeah for a small office!) and generous usage of my overgrown sage, thyme, and marigold plants. My only large exception will be that we are really low on meat in the freezer, if I find a good deal or have time I will start restocking that. Coincidentally, yesterday we decided to do $0 spend, or as close to it as possible, for the next week or so. I don’t really want to get into why, but I’m pretty excited as I’ve been trying to nudge my husband toward this sort of thing for literally years, and this time it was his idea! Tonight I’m going to buy milk (for the kid), bananas (also for the kid), and eggs (baking), and that’s it for the next week. I have meat in the freezer, literally pounds of rice, pasta, oats, and flour, plus some fresh vegetables from last week’s grocery shop and 8 cups of fresh pumpkin puree in the freezer. It’s going to be a fun challenge and an opportunity for all the baking I’ve been meaning to do. I also need to double-check what I’ve got on hand, though; I need easy protein options for my child throughout the day, and depending on what I’ve already got I may need to add some roast beef or cheddar to my shopping list. My November so far has been the opposite of this. I am getting all of my holiday shopping done before December 1 (including any food that will last). However, I am trying hard to be very mindful about what I get this year. So far my kids’ gifts have come from craigslist and I’m still trying to keep that trend going! In the summer I do a CSA and don’t know what I’ll get until the day of so we just eat weird meals around the CSA food, but I’m back to meal planning which helps the budget. So I guess instead of No Spend November, I’m trying to do Mindful November, or Plan Ahead November. Neither of which sound as cool.